The music of Ambiance really made the evening special. Thanks for your fine performance, and for your flexibility and cooperation. Larry Hicks, Senior Communications Representative, IBM Canada Ltd.
The music of Ambiance was an invaluable contribution to our annual meeting. Your music was beautiful, your timing right on, your presentation perfect and your professionalism very much appreciated. Thank you! A finely honed ensemble comprised of two gifted and sensitive musicians. Their playing is always well balanced and thoughtful, and their adaptations of standard as well as unusual repertoire are effective and superbly played. 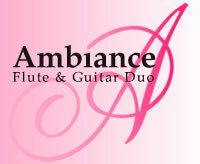 The enthusiastic response to Ambiance has given our professional concert series new life. When we needed music for the grand opening of our Toronto office, Ambiance made it easy. The professionalism they showed in the booking process, in setting up their equipment and performing just the right repertoire meant I didnt have to worry about the music while I was busy entertaining clients. Helen Sawick, Deutsche Telekom Canada Inc.
We want you to know how much we enjoy your CD, A Little Night Music. We love it! Its nourishment for the soul. You added the perfect touch of class to the event. We received extremely positive feedback about your beautiful music from our conference guests. Copyright © Ambiance Music 2005 all rights reserved.